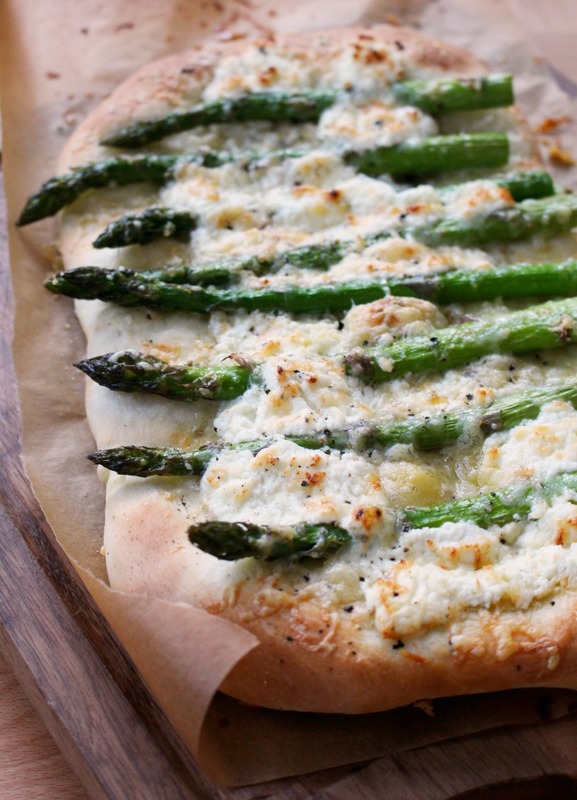 Spring has been crazy early this year, and now so is asparagus – by like a month. They started picking mid-April at Edgar Farms by Innisfail, and the norm is around the middle of May. It’s a short window – they typically pick (by hand, from their own homemade motorized picking carts) from mid-May until the end of June, so at this time of year I eat as much asparagus as I can handle. Our sunny days and cool nights make for particularly sweet asparagus with purply tips – I know I’ve said it before, but just a reminder: thinner isn’t necessarily better. Thick stalks are every bit as sweet – you just don’t want the bendy and woody ones. And YES – they are fab on a pizza. You don’t even have to bother shaving them into thin ribbons, although that does look pretty. Toss them on whole! To really streamline/fancy up things, you could thaw a package of puff pastry to use in place of the pizza dough, and cut the pizzas into strips for a party. Goat cheese and asparagus are best buds, but you could do feta, or brie, or something melty, or a combination of all of the above. 2Divide the dough in half and roll each into a rough oval. Place on a parchment-lined baking sheet (or two). 3Snap the tough ends off the asparagus wherever they naturally break. Place on a plate or in a bowl, drizzle with oil and toss with your hands to coat. 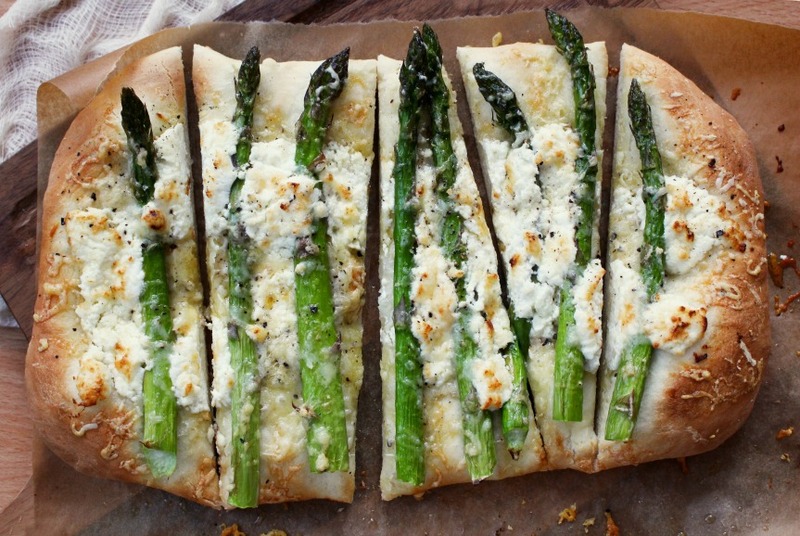 Drizzle the pizza dough with oil and lay asparagus in a row on top. Sprinkle with salt and pepper. 4Crumble the goat cheese over each pizza, and sprinkle with grated Gouda, Parmesan or cheddar and bake for 15-20 minutes, until bubbly and golden. 5Cut in between the asparagus into strips to serve. Serves 6-8.